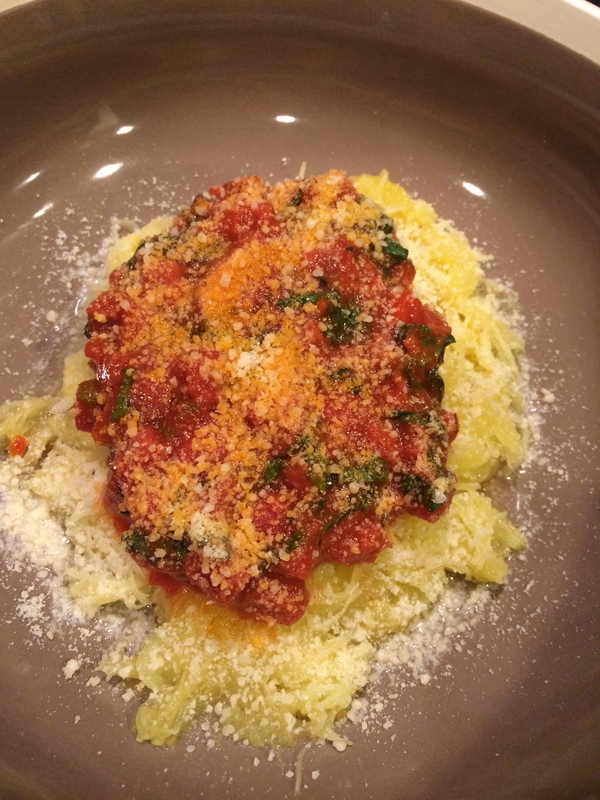 spaghetti squash and pepperoni sauce – wine.dine.repeat. Yes, I did in fact say pepperoni sauce. it’s decorative gourd season! I for one could not be more excited about it. 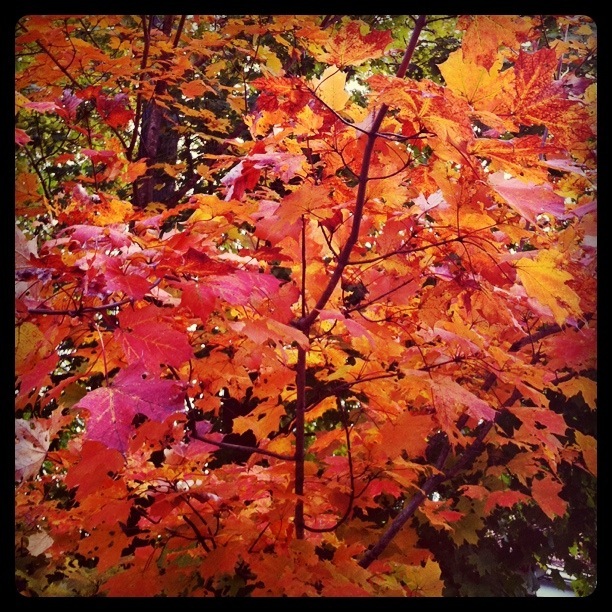 In this little corner of America, the leaves are once again mimicking the shades of a brilliant sunset…making driving on highways pleasurable and reminding us all to stock up on cider. The farmers’ markets are also shifting out of their summer ware as zucchini and pattypans are being replaced by delicatas and butternuts. 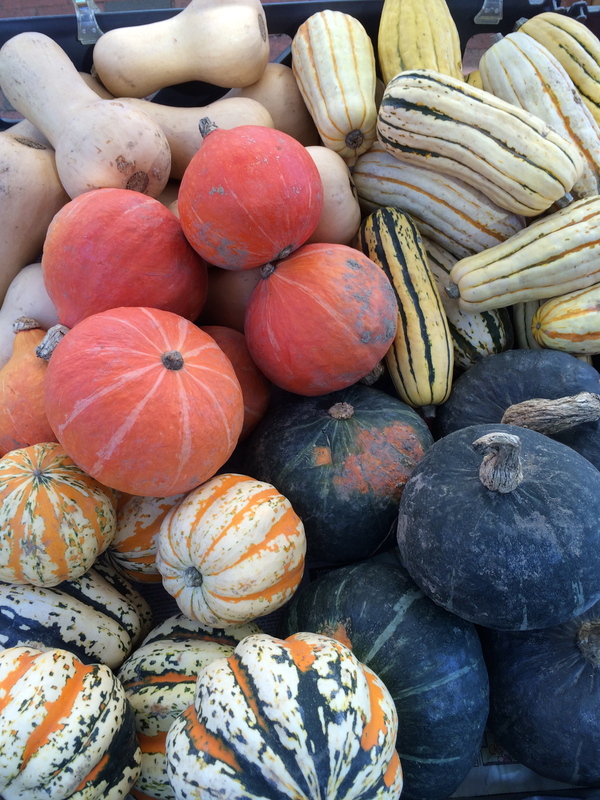 Squash is a quintessential piece of the autumnal diet. 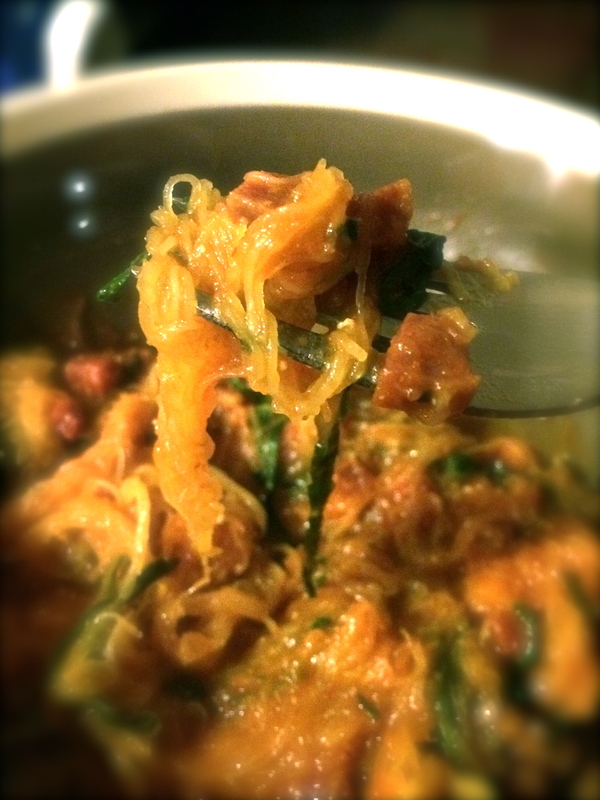 And while each is great in its own right, spaghetti squash holds a special place in this carb lovers heart. It is an exceptionally deceiving substitute for pasta, mimicking it in color and hearty texture. This dish is ridiculously easy, and comes together quickly for a veggie-centric weeknight dinner. Salami or sopressata can sub in for pepperoni. In a pinch you can use a favorite jarred tomato sauce. And there are greens thrown in just for good measure so you remember to pat yourself on the back for eating so many vegetables. Let’s celebrate decorative gourd season the right way. the base of the sauce is adapted (barely) from the incomparable Deb Perelman of smitten kitchen. I trust her on almost everything because unlike me she is utterly meticulous in her testing and retesting. I take a more…devil may care approach. 1. Set the oven to 425. Line a baking sheet with parchment paper. 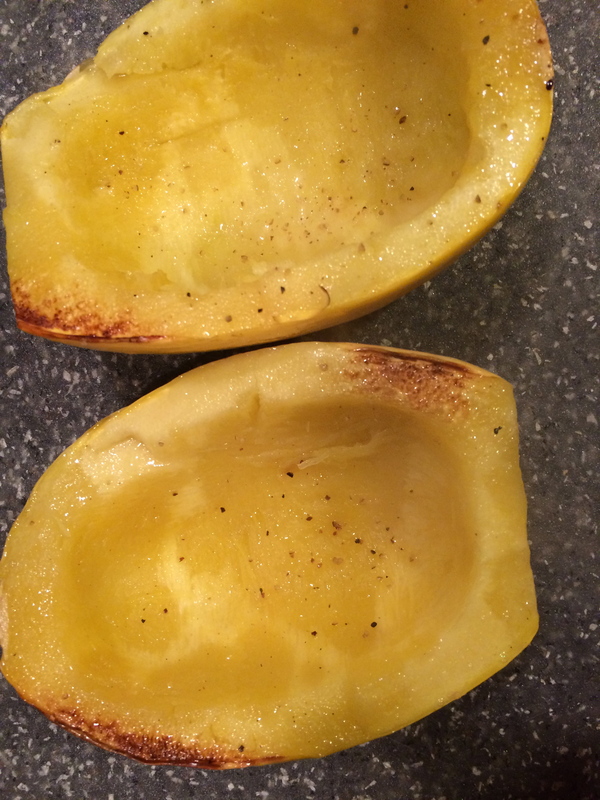 Slice the spaghetti squash lengthwise and remove the seeds. Drizzle with olive oil, sprinkle with salt and pepper to taste, and place flesh side down on the baking sheet. Roast in the oven for half an hour, or until fork tender. 2. Remove the squash and let it cool enough to handle. Using a fork, scrape the flesh out of the skin. It will come out in strands and look like spaghetti. Put in a large bowl and set aside. 3. In a large pot over medium heat, melt a tablespoon of butter, and add onion. Let cook 5 minutes or until just translucent. Add in the garlic and greens, then cook an additional minute. 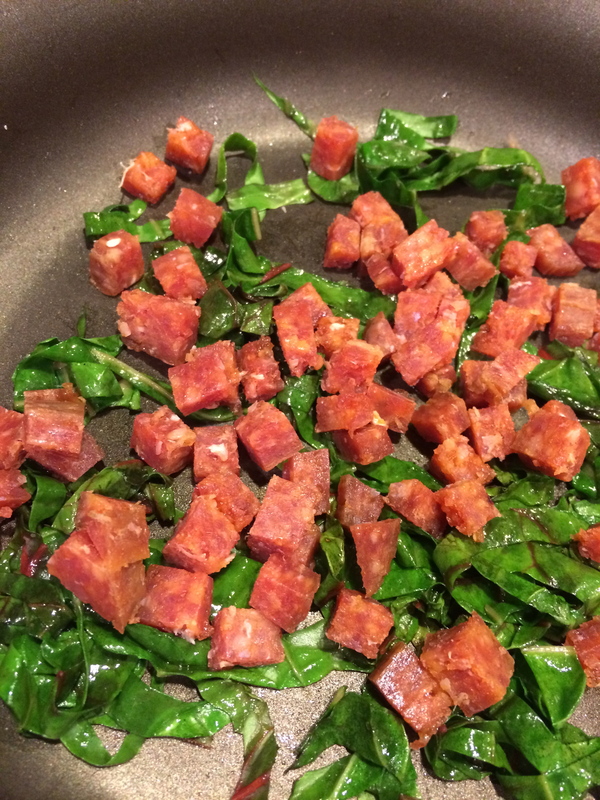 Add in the rest of the sauce ingredients and cook together over medium-low heat for 10 minutes or until flavors meld and the greens are well wilted (this takes a bit longer if you are using chard as it is tougher than spinach). 4. Pour the sauce over the squash and mix together to coat the strands. Top with parmesan cheese for a truly pasta-esque experience.